The CV Tools Module is a versatile voltage processor intended for control voltage manipulation such as adding, subtracting, attenuating, amplifying and offsetting. It can also be used with audio signals to great effect. It has a cascade architecture. This has a summing stage at each of outputs OUT2, OUT3 and OUT4 (denoted by the ? symbol); OUT1 is added to OUT2, OUT2 is added to OUT3 and OUT3 is added to OUT4. Consequently OUT1 is just from channel 1, OUT2 is the sum of channels 1 and 2, OUT3 is the sum of channels 1, 2 and 3, and OUT4 is the sum of all four channels. However, when a patch lead is plugged into any, or all, of outputs OUT1 to OUT3 it disconnects that output from the next channel’s output summing stage. 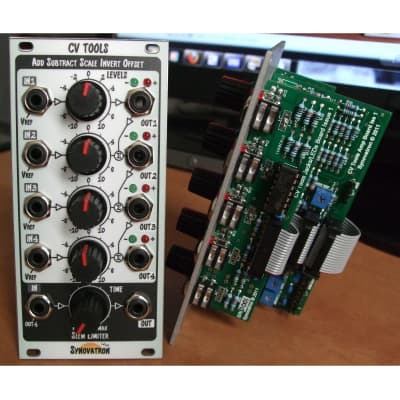 It is a polarizing mixer which allows an input signal’s level to be adjusted or inverted. Each channel has a basic gain of 2 and therefore an input signal can amplified by up to a factor of 2 or inverted and amplified by up to a factor of 2 (i.e. -2). This is useful for adding and subtracting signals in varying degrees.